At the beginning of the summer, I wrote a post about my mystery plant. I wasn’t exactly sure what it was. It was supposed to be a tomato, but didn’t look like one. So I adopted two of them out and planted the other one myself. All three found sunny summer homes. Mine grew into a monstrosity, despite being planted in a large pot on the back deck. 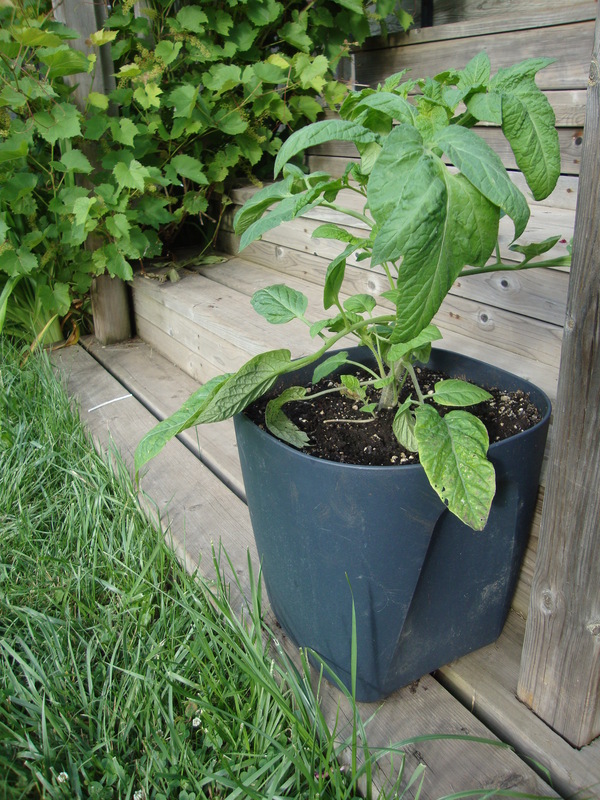 The leaves gradually began to look more like a tomato plant, although they were super-sized. But it was the smell that told me it was indeed a tomato. That musty odour is unmistakable. A. planted hers directly in the garden. It resented transplanting, she said, and sulked for a little while. All her hand-wringing and whispers of “Don’t die! Don’t die!” must have had a healing effect, though, since it grew up just fine. L. took hers farther away to their summer cottage. I haven’t heard from her yet but I’m sure in southwestern Ontario it must have flourished. As for mine, when it finally bore fruit, the tomatoes were big and light red (which is technically pink, I suppose, but it seemed more reddish to me). The first fruit was seedy and sweet and very juicy. When the second was ready to be eaten, however, a racoon beat me to it–I went out in the morning to discover that a critter had chewed half the tomato off, leaving it still attached to the vine. When the third tomato was ready, the same thing happened. But by the fourth tomato, I was much wiser and picked it just before it was ripe. That one was juicy and delicious, too, especially since I had outwitted that masket bandit. And if I hadn’t gone away on a short vacation, leaving a neighbourhood boy to water the garden, there might have been more fruit. But when we returned from camping, the tomato looked funny. It was water-logged and so wet that I had to tip the pot over to let the water gush out! Drat. My plant didn’t die, mind you. It just didn’t grow any more tomatoes. So the mystery is solved: those plants that I had such trouble growing and that didn’t look at all like tomatoes were from the heirloom seeds I had purchased: watermelon beefsteak. I am grateful that I had friends to help me sort that out but I can’t say I am going to grow that same variety next year. They were way too much work and way too popular with the raccoons. There is something to be said for accumulated wisdom, and not repeating your mistakes over again. Gardening is teaching me about that. 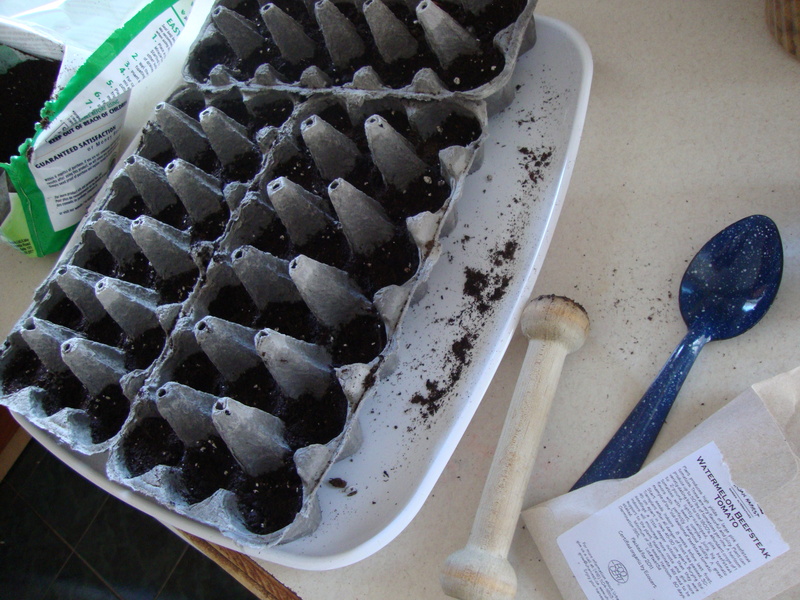 This entry was posted in Uncategorized and tagged friends, gardening, life, vegetable. Bookmark the permalink. 8 Responses to The Great Tomato Mystery: solved! Kris! I have pictures of Annie, the wandering tomato … will upload soon! She flourished with an abundance of flowers but few offspring. Only one grew to fruition. It looked just like your picture. I don’t know what it tasted like … the kids beat me to it! I kept her in a planter and she grew fine down by the shores of Lake Erie. Thanks for letting me have our little orphan Annie plant. I’m so glad to hear about Little Orphan Annie! Do send some pic’s. I’m glad the kids got to taste it, at least. And thank you for giving the poor thing a home for the summer. Kristine, can you email me and I wlll upload some pics! Like Lorraine’s tomato plant, ours also had many blooms but only one tomato. 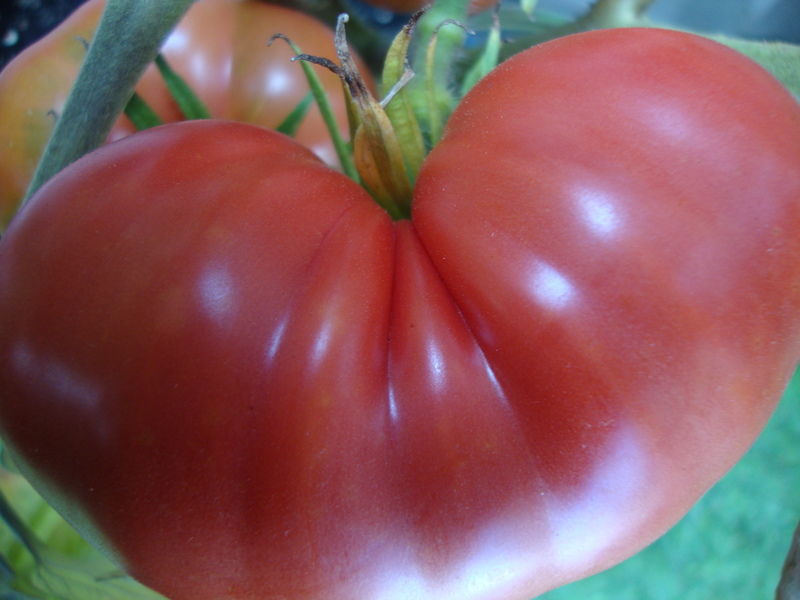 It grew to a normal tomato size but never really changed colour. Chipmunks have been the bane of our vegetable garden this year and the mystery tomato mysteriously disappeared one night. The lost has been found! Under the cucumbers!! 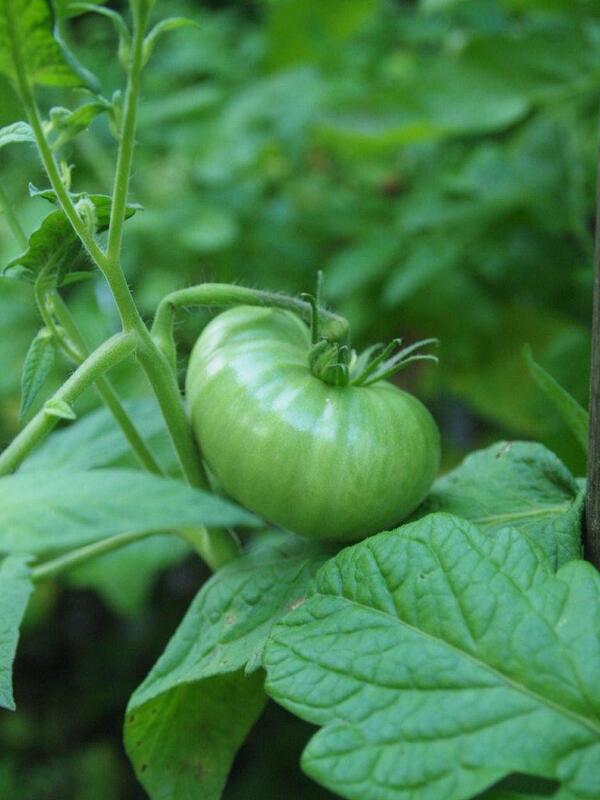 The mystery tomato is still mostly green with a hint of pink. It now sits proudly on the kitchen windowsill – I’m nursing it back to health again. Under the cucumbers?! Hmmm. I wonder what critter was involved in that? Ah well, at least you found it and can enjoy it on the windowsill. I am always amazed at how tomaotes can just sit there and ripen into a whole different colour. My tomatoes have been very popular with the squirrels! Oddly though, not the little yellow cherry size type. They instead have taken over the whole rest of the garden. Yes, I have a sprawling cherry tomato plant in a back corner. It’s amazing how much ground they can cover. Too bad you have to share your harvest with the squirrels, though!